Thanks so much for coming to Colorado Springs and doing a family Life in the Spirit Seminar for us at Holy Apostles Catholic Church . We had about 30 middle and high schoolers and OVER 100 adults go through the seminar. 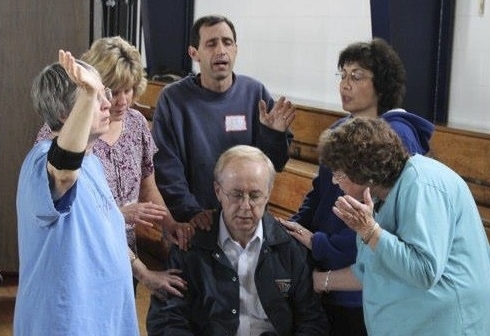 Over the last forty some years, millions of people have opened themselves to experiencing the release of the spiritual gifts they received in the sacraments of Baptism and Confirmation through Life in the Spirit Seminars (Is 11:1-2 and 1 Cor 12:4-11). 2Tim4 Ministries has adapted the delivery of the Life in the Spirit Seminars to engage an inter-generational audience, making it easy for an entire parish community to come together for a powerful experience. This seminar is usually done over seven consecutive weeks, on a weekend retreat, or in the context of a parish mission. The Life in the Spirit Seminar presents the central truths of the Gospel: God's Love, Salvation, The New Life, Receiving God's Gift, Praying for Baptism in the Holy Spirit, Growth and Transformation in Christ.